One of the crowning jewels of all London attractions, the British Museum could take several days on its own to see all that you would like to see. There is no admission fee to the museum. Trying to cram it into 2 hours, as we plan to do, just is scratching the surface, so we need to focus on the things that interest our family - Medieval Europe and the Egyptians. We are aiming to do this on a Friday night when the museum is open late - till 8:30. One of the most interesting exhibits is in a temporary location through the Spring of 2014 when it gets a brand new home. The exhibit contains highlights from the Sutton Hoo ship burial. This was a treasure of the early Anglo-Saxon Britons. The display is on the right as you enter, in the rotating displays gallery. 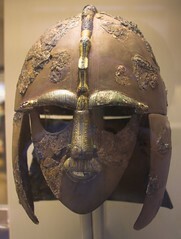 For a fascinating overview of the Sutton Hoo story, checkout the quality and highly entertaining British History Podcast. Afterwards we head to the America's section for Mom to see an Easter Island Moai statue. We will go through the reading room heading north. Then we will come back out of the reading room and to the West to the Egypt Section to see the Rosetta Stone and Ramesses the Great. Among other book series, my boys have enjoyed the Kane Chronicles by Rick Riordan. 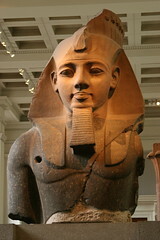 The Rosetta Stone and the British Museum play an important part in that story. A visit to see it in real life should add depth to that story. The Egyptian section also has a number of Shabti, or clay figurines found in Egyptian pyramids. We will end the evening by heading upstairs to Level 3 for the Mummy of Katebet. If your family is into the Egyptian theme, also make sure to go see Cleopatra's Needle. This is an obelisk on the Victoria Embankment by the River Thames. It is a mile walk south of the museum and very close to Covent Garden. Level 3 is also home to Medieval Europe. If there is time and people are still awake check out something different like the Samurai armor on the 5th level. If you are there between 11 AM and 4 PM search out one of the Hands On desks to give your family the opportunity of actually touching and handling some of the artifacts the museum displays. If the need arises there are bathrooms on every floor throughout the building. If you are visiting with younger children, consider stopping in at the family desk in the Great Court and asking for an Open Futures family trail guide. These are are preplanned walks to "Hunt for Dragons" or "Sailing on the Nile." They do have WiFi in the museum that you can use and an iPhone and Android app to go with it. Make sure that your phone is set correctly. We will be walking to the museum from Covent Garden by coming up Drury Lane to Museum St. Though I have looked I have not found a bakery on Drury Ln. Either way I think I will need to bring a ginger bread man cookie so we can discuss the muffin man. If you are taking London Transport there are lots of options. The London Tube has 4 stations within 1/2 mile (800 meters) They are Goodge Street, Tottenham Court Rd, Holborn, Russell St. and are served by Central, Northern and Piccadilly lines. There are a dozen bus routes on New Oxford, Gower St and Southampton Row. If your kids are older consider using Barclays Cycle Hire bicycles. Going on a family vacation builds memories, provides life changing experiences and helps teach about the world we live in. Take time to explore, enjoy and have fun. If the British Museum sounded interesting, you may also like the London Natural History Museum. You can also look at our entire list of London Attractions.